Zach Oleynik and Pilar Nemer left the house in a double eviction episode on Wednesday 20th May 2015, on Big Brother Canada 3. 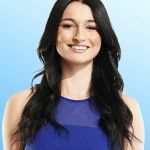 With just one week until Big Brother Canada’s season three finale, Ashleigh, Brittnee, and Sarah and Godfrey are the remaining houseguests, and only one which will win the $100,000 grand prize. Big Brother Canada’s final three episodes air this Sunday at 7pm ET/PT, Monday at 8pm ET/PT, and conclude with its two-hour season finale on Wednesday, May 27 at 8pm ET/PT on Global (+5 hours for UK time). Following last week’s super secret power that saved both Godfrey and Brittnee from eviction, resulting in Bruno’s blindside, the houseguests competed in a HOH competition that saw Sarah, take the win. Building on Queen B’s former reign, Sarah set her sights on splitting up Zach and Ashleigh’s showmance, nominating them both for eviction. Ashleigh went on to win the POV, saving herself from the chopping block, and Pilar (aka Pili) was nominated in her place. Ultimately, 22 year-old Zach was sent home in a unanimous 3-0 vote. The houseguests were shocked with another surprise from Arisa, informing them of a double eviction. Brittnee claimed the crown again, winning the HOH competition and securing her safety for another week. Brittnee nominated Ashleigh and Pili for eviction before competing in the POV competition. Ashleigh won her second straight POV, saving herself, and forcing Brittnee to name Godfrey as the replacement nominee. With just two houseguests voting to evict, Brittnee was forced to make a tie-breaking vote after Ashleigh voted for Godfrey and Sarah voted for Pili. Brittnee decided Godfrey was worth his weight in sleep and voted to evict 22 year-old Pilar Nemer, who joins Zach and the other six houseguests in the jury house. The Final Three Episodes of the Season are on Sunday at 7pm ET/PT, Monday at 8pm ET/PT, and Wednesday at 8pm ET/PT on Global (+5 hours for UK time). Before Wednesday’s finale, the Big Brother Canada Side Show is bringing fans an in-depth pre-show, with some extra special guests, on Tuesday, May 26 at 8pm ET on Slice. Big Brother Canada’s houseguests are competing for a grand prize of $100,000, a $25,000 gift card from The Brick, and a $10,000 trip of a lifetime courtesy of Twistos.